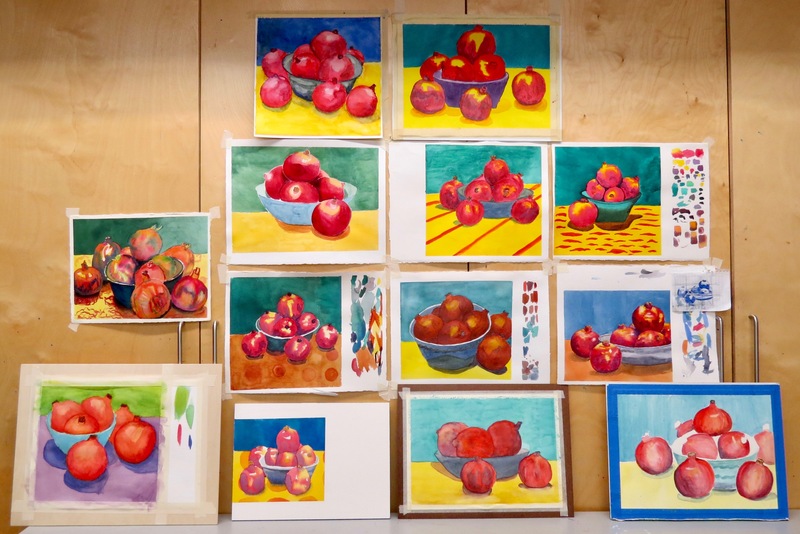 « Fall Watercolour Classes at Arts on Adrian – Week Three! Wednesday Watercolour at DVSA – Week Six! The pomegranates made their way from Toronto to the Dundas Valley School of Art just in time for the Wednesday evening class. I’ve been focusing on basics with this group and some of the students requested a demonstration of even, ungraded washes over larger areas. Good idea! Nothing is intrinsically better or worse in a watercolour painting. There are roles for both crisp and soft edges. Graded washes can be very attractive but a flatter, even wash may be appropriate at times. At the very least, the watercolour painter should know how to do it. There was a lot to talk about for such a simple looking thing. A wash of a single pigment is easier to apply than a wash comprised of two or more pigments. Lighter washes (more water) are easier to apply than darker washes (more pigment). I discussed how to plan the direction of the wash and follow the bead. Mix enough paint so you don’t run out partway through. Don’t dip your brush in the water as it will dilute the wash and often create blossoms. Float the paint on gently and don’t grind your brush into the paper. It takes practice and thought. It was a challenge but everyone will improve gradually. Overall, the students had a very strong evening of painting and I was pleased to see the progress. Technique will get better; again with lots of practice. I’m seeing much more confidence in the handling of values and colour than even a few weeks ago. Well done! This entry was posted on 19/11/2018 at 11:20 am and is filed under Barry's Demonstrations, Dundas Valley School of Art, Studio Classes. You can follow any responses to this entry through the RSS 2.0 feed. You can leave a response, or trackback from your own site.